Horse shoe studs, sterling silver. 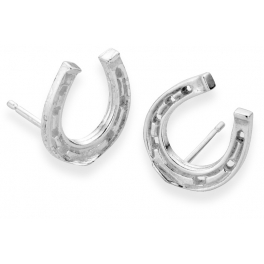 Bring yourself or a loved one good luck with these sterling silver horseshoe stud earrings! Beautifully crafted, these horseshoe earrings are great for everyday use or for a special occasion such as a day at the races. They make the perfect gift or could simply be for your own collection of equestrian jewellery (jewelry). Measuring 11mm high, they come presented in our black leatherette presentation box.